Secrets often don’t stay secret for very long but in two-time Oscar-winning Iranian director Asghar Farhadi’s latest film, EVERYBODY KNOWS, the big secret is something that everyone in a small Spanish town knows but no one talks about… until a family crisis unleashes both that secret and a few others too. Laura (Penélope Cruz, MURDER ON THE ORIENT EXPRESS; LOVING PABLO), has lived in Buenos Aires for about 20 years with her husband Alejandro (Argentine actor Ricardo Darín) and two kids, 16-year-old Irene and 7-year-old Diego. She’s now returned to her hometown located somewhere near Madrid for her sister’s wedding and she’s brought the kids along for the festivities. Everything starts off perfectly well with a happy and lively celebration but it all comes to a crashing halt when Irene is kidnapped from under the wedding guests’ noses. The kidnappers are demanding €300,000 in ransom, a sum that Laura doesn’t have. In fact, no one has that kind of money except for Paco (Javier Bardem, LOVING PABLO; MOTHER! ; TO THE WONDER), who is Laura’s flame from years ago and is still her good friend today. As Laura relies on Paco to help find Irene, suspicion ripples through Laura’s family as they try to work out who may have snatched the teenager. There’s no shortage of people with motive, from Paco himself to Laura’s father and even to Alejandro, who decided to remain in Argentina rather than join his family at the wedding. For many in Laura’s family, we learn, what’s past is not past. Many of Farhadi’s films explore class divides and EVERYBODY KNOWS is no exception. Everyone in Laura’s town thinks that she and Alejandro must be wealthy because they live in Argentina. Many are also resentful of Paco, who began life as the poor son of a labourer but is now a landowner who produces a healthy crop of wine-quality grapes tended to by some imported workers. As warm and loving as Laura’s family and friends appear to be, deep down they don’t like what’s happened to the status quo. Watching the wedding sequence you could be forgiven to think that it was directed by a Spaniard. Farhadi clearly understands the culture and he captures it flawlessly on film. The director has said in interviews that while he was researching weddings in the south of Spain, he noticed that they resembled his own memories of weddings he had attended as a child in Iran. Equally impressive is that Farhadi doesn’t speak Spanish but he said in a Q&A at the screening that I attended that language was the smallest of his challenges. 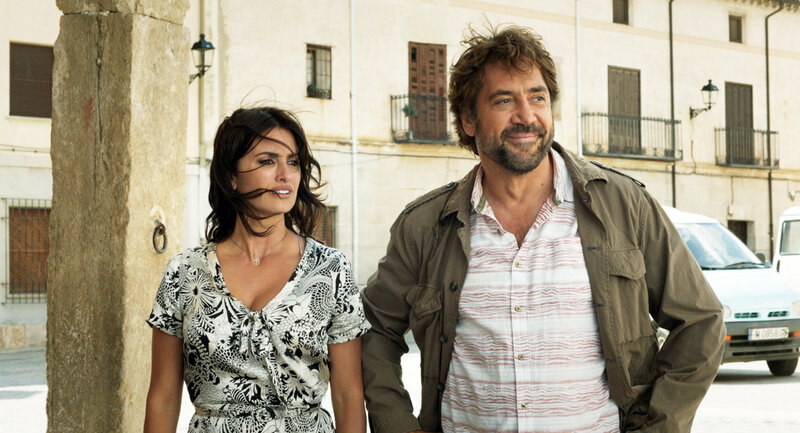 Cruz and Bardem, who can always be counted on for putting in solid performances, don’t disappoint here and it’s nice to see the married couple off-screen play ex-lovers rather than a married couple on-screen. Cruz is absolutely resplendent in the wedding sequence which explodes with passion. Unfortunately, once the film’s focus shifts to finding Irene, the story becomes less interesting, perhaps because we don’t get invested in the teenager’s situation. By the time we learn who did the kidnapping and why, the film’s pacing has almost come to a sputtering halt. There are some good scenes of secrets and motivations being revealed but there needed to be more of those and fewer of Cruz looking powerless. While not Farhadi’s best work, EVERYBODY KNOWS is still fairly good fare. It won’t win any major awards but it’s still worth checking out.